A 16-foot yellow canoe in the front window (also for sale) beckons shoppers. Heard of Wunderkammer? It’s a hidden gem of a place, though not so hidden anymore — the curiosity shop recently re-opened in a bigger and better spot just down the block from their original space on Dalhousie Street. Tamara Steinborn and Nathan Dubo, partners in life and work, moved from Montreal a few years ago to open their Lowertown shop and are already enjoying steady success — to the point where their intimate store could no longer contain the volume of jewelry, home decor, and vintage finds that their customers were asking for. Wunderkammer’s new spot has the same warm, well-curated vibe as the original, just with a bit more breathing room — and a lot more baubles. 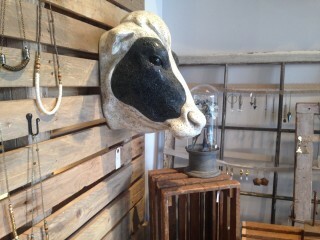 The new and improved store houses much more in the way of home decor and accents, including bigger pieces like wardrobes and wall art. Would you like a cow’s head with that necklace? 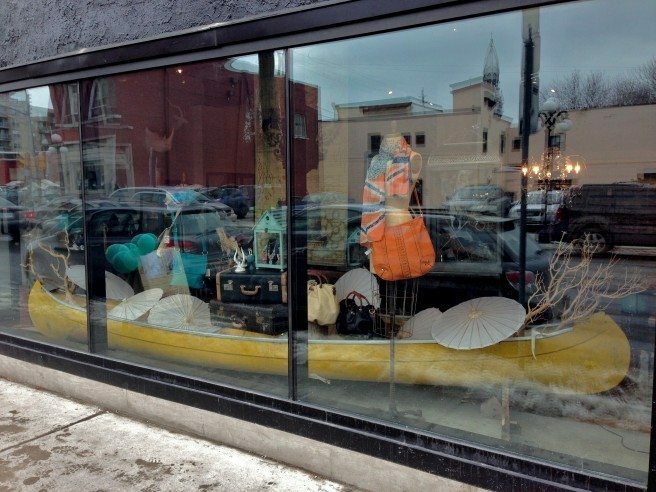 A 16-foot canary-yellow canoe bursting with treasures, a cow’s head bust, and an animal’s jawbone filled with flowers add to the unfussy, unpolished whimsy of the space, which the team designed and decorated themselves. 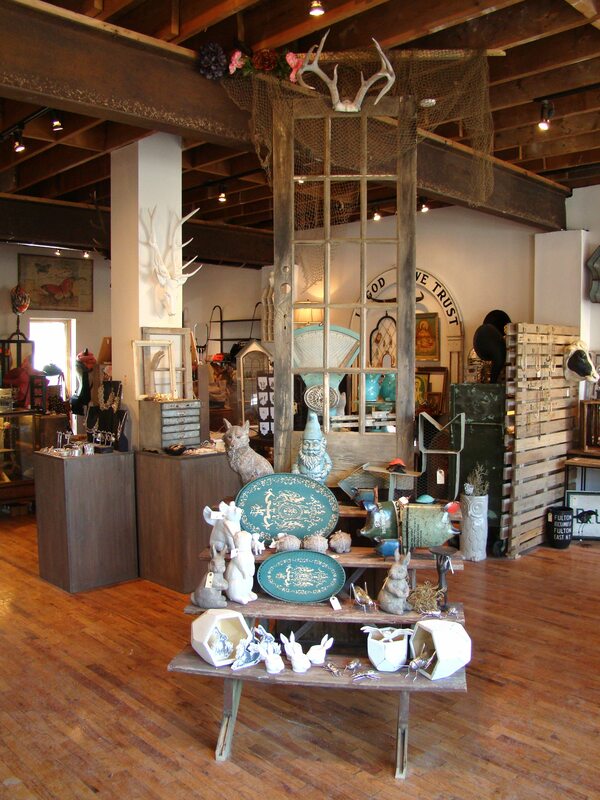 Other fun elements include a sculptural pallet wall, and an old set of stairs leading to an antique door that floats in the middle of the store. As always, there’s jewellery for every taste — including Steinborn’s own collection, Früg — with hundreds of new pieces per season. (Best bets include those featuring brass, gold fill, and statement stones.) Früg is also sold in many Toronto shops, which is one reason why they decided to set up camp in Ottawa. “There’s a stable economy here, and we thought we could fill a void in Ottawa for people looking to find something different,” says Dubo. “The city is also great geographically, since it’s easy to get to Toronto and Montreal and New York, all of the places where we source our pieces.” The opening of the new shop is just the first of a number of events to celebrate Früg’s 15 years in business. Next up, Dubo says, is another jewelry collection launch. The new store has more breathing room, but with the same cozy, whimsical feel of the original. So, if artisanal and limited edition is your thing, don’t worry: the larger space only enhances Wunderkammer’s ability to showcase the eclectic collections that make them a must-stop shop. Oh, and in case you were wondering, “Wunderkammer” translates to “wonder room,” and it’s a truly a fitting title given the range of treasures on offer. Wunderkummer. 234 Dalhousie St. 613-860-3510.